My favorite thing about my "smart" phone is the ability to immediately look up the definition of a word new to me in a book. I vividly remember where I was sitting on a Sunday morning in 2002 when I first read this title, because I had to put the book down and find a dictionary. The word incunabula was new to me. I am excited to share this author with you. A disgraced Denver cop turns his lifelong rare book collecting into his profession. The crime and mystery surrounding rare book acquisition is deadly. 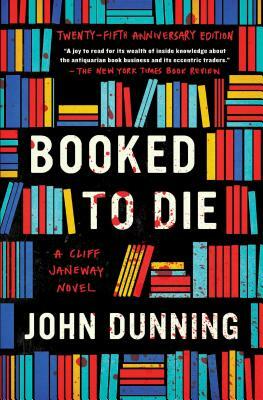 Booked to Die, the first book in John Dunning’s bestselling, award-winning Cliff Janeway series, is “a joy to read for its wealth of inside knowledge about the antiquarian book business and its eccentric traders” (The New York Times Book Review). Denver homicide detective Cliff Janeway may not always play by the book, but he’s an avid collector of rare and first editions. Bobby Westfall is a local bookscout, a gentle and quiet man who has sold enough valuable books to keep himself and his cats fed and housed. When Bobby is murdered, Janeway would like nothing better than to rearrange the suspect’s spine. But the suspect, local lowlife Jackie Newton, is a master at eluding the law, and Janeway’s wrathful brand of off-duty justice costs him his badge. Turning to his lifelong passion, Janeway opens a small bookshop—all the while searching for evidence to put Newton away. When prized volumes in a highly sought-after collection begin to appear, so do dead bodies. Now Janeway’s life is about to change in profound and shocking ways as he attempts to find out who’s dealing death along with vintage Chandlers and Twains. “One of the most enjoyable books I’ve read” (The Denver Post), Booked to Die is the first in the Cliff Janeway series. It is “a standout piece of crime fiction…Compelling page-turning stuff” (The Philadelphia Inquirer). John Dunning has revealed some of book collecting’s most shocking secrets in his bestselling series of crime novels featuring Cliff Janeway: Booked to Die, which won the prestigious Nero Wolfe award; The Bookman’s Wake, a New York Times Notable Book; and the New York Times bestsellers The Bookman’s Promise, The Sign of the Book, and The Bookwoman’s Last Fling. He is also the author of the Edgar Award-nominated Deadline, The Holland Suggestions, and Two O’Clock, Eastern Wartime. An expert on rare and collectible books, he owned the Old Algonquin Bookstore in Denver for many years. He lives in Denver, Colorado. Visit OldAlgonquin.com. "A joy to read... A whodunit in the classic mode." "A knockout.... One of the most enjoyable books I've read in a long time." "A standout piece of crime fiction... Compelling, page-turning stuff." "I am an unabashed admirer of John Dunning's Booked to Die. [No one] can fail to be delighted by the sort of folkloric advice Janeway carries with him." "Fascinating... Assured and muscular prose... Very cannily and creepily, Dunning shows how quiet men with civilized tastes can turn into killers... The payoff, in pleasure, is for the reader." "Compelling... Vividly realistic... Fascinating and utterly convincing... A suspenseful, well-crafted mystery that should keep readers guessing right up to the closing paragraph." "A perfect mystery. Intelligently written; the action is bafflingly logical; the reader learns something, and it's got a sucker punch of a finale." "Crisp, direct prose and nearly pitch-perfect dialogue enhance this meticulously detailed page-turner." "Dunning is an amazingly assured writer, willing to head off down narrative side streets, secure that his readers will follow. He's never wrong. Booked to Die joins the select ranks of specialist crime fiction that works on all levels." "Lively, seductive...John Dunning deserves to win an Edgar for this Denver cop-turned-bookman tale." "Tough to put down...Booked to Die is a tightly written and intelligent mystery with a wonderfully varied cast of memorable characters."